Watching a loved one fight for their life is an extraordinarily painful process, at the age of twenty I have watched three family members struggle to survive. My grandfather was on an oxygen tank in all my memories, he died when I was eight or nine and they found cartons of cigarettes hidden in his closet. The man struggled for his life but refused to give up the habit that had gotten him there, you could say he was stubborn. My grandmother was diagnosed with cancer right before my grandfather died, and two years later my uncle was diagnosed. (All of them had cigarette related cancers, affecting different parts of the body but they included lung and mouth.) My uncle’s fight was short and it took his life when he was only forty-five. My grandmother lasted until my freshman year of high school; her fight was long and very difficult to watch. It was the most humbling experience that I have been exposed to. I watched a woman who refused to stop moving be reduced to almost nothing; it was the scariest thing I have ever seen. She helped me in so many ways and I have to give her credit for continuing my education. As a full time undergraduate student and a full time employee for Starbucks Coffee, the repercussions to my actions seem like they are decades away. It seems that most fatalities today are cancer related, exposure to everyday things have continually been correlated to developing cancer. As a very real future problem, this essay is a unique way to explore an extremely real possibility. Many diseases have been the subject to law firm commercials over the past few years; one of the more recent hot topics is mesothelioma. The pleural mesothelioma that James “Rhio” O’Connor was diagnosed with begins in the lungs and is the most common form of the cancer. The symptoms show up years later and besides bumps under the skin on your chest all seem pretty benign (cough, shortness of breath, chest pain, etc. ), by the time most people are diagnosed they have less then a year to live. When a doctor walked into the exam room and delivered Mr. O’Connor’s one year life expectancy, he refused to accept the limited options that would not help prolong his life. His cancer had progressed too far for surgery and chemotherapy offered nothing but a slight lessening of pain. 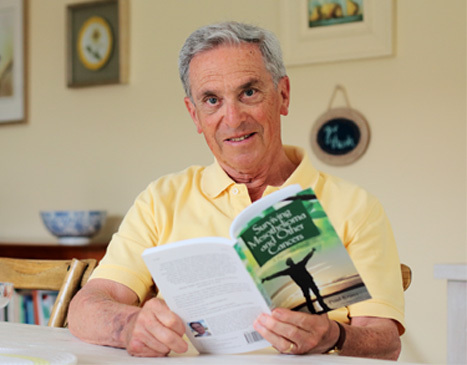 Through his determination to survive, his own research, and the help of innovative doctors, he was able to combine a well-disciplined life with health supplements, a proper diet, and an exploration into mind-body medicine that prolonged his life expectancy. Rather then allowing the inoperable tumor to defeat him, he took a stand and proved the doctors wrong, leaving a legacy and a book to inspire the masses. As a senior in high school, I was diagnosed with depression. I was consumed by the belief that I wanted myself dead. The medication that I was put on made me feel like a zombie and I realized I would rather deal with the “ups” and “downs”. Every counselor I spoke with recommended that I continue with the medication, try new ones until I found the right fit. That never felt like the right option, so I decided it was time to prioritize. If I didn’t want to medicate myself I would have to learn how to deal with the lows without becoming suicidal. It took a lot of soul searching and learning about who I wanted to be. Rather then allowing myself to be consumed by the past and things that were out of my control I reprioritized. Now three years later the thought of death is terrifying, there are too many things I want to experience. If I was faced with a deadly cancer prognosis I would do everything in my power to increase my life expectancy. After watching a sixteen year old classmate and my grandmother suffer through chemotherapy, I would opt for almost anything except that. A new, innovative method of treating cancer could be dangerous, but let’s face it the options are sit around for a year and wait for death to come or do everything in your power to prolong your life. Chemotherapy can be helpful in some cases, as can surgery, but there has to be other innovative methods out there. New methods will never gain recognition if the old methods are the only ones people use. The internet has made research increasingly easy, opinions from millions of people are just a click away. Many doctors even have websites that describe their practices to make finding a good fit a little easier. It seems that Mr. O’Connor chose to try a more Eastern approach to medicine, rather then using the technology we have available (which offered him no real help) he chose to try more basic life changes. His desire to live provided the extra strength that his body needed in fighting the disease. Having watched my grandmother personally defeat her own life expectancy, it is moving to know that it could have possibly been her desire to stay with us for a little longer. She held on for an extra nine months, in those nine months she witnessed me graduate from high school and go of to college. When you are watching someone struggle to survive, it is encouraging to know that willpower will actually help. The willpower to research your own disease and try things that other doctors may consider risky is important. If faced with James O’Connor’s prognosis, I would act very similar to him. Accessing all available research and dealing with it the most natural way possible, never forgetting that a belief in your own life can offer one of the best treatments.